Back in that first golden summer – well, it was late autumn going on winter, just the time to acquire a new DSLR when the days were short and the light awful – the Konica Minolta Dynax 7D arrived with a plastic screen protector in the box. A week later the first one had, after several recaptures, successfully jumped ship leaving the decks bare. Two more 7D screen protectors later I finally sold the 7D, but only after it had spent three years in the studio where the worst that could happen was a soft landing on the carpet. My Alpha 100 never got a protector but never seemed to get scratches on the LCD. Then the Alpha 700 arrived, and with its lovely hard coated screen I got the same sense of durability you get from glass. Wrong again! After six months, my Alpha 700 screen was covered in a fine patina of scratches with one slightly visible one. The coating was suffering and I bought a clip-on Sony hard plastic protector. Unlike the 7D model, this one stayed put, but over the next two years of use became a rather scruffy impediment to screen reviewing. From then on, I decided to put screen protectors on all our Alphas. The Alpha 200 got a thin layer design for mobile phones. It did the job perfectly. The Alpha 350 got a much thicker plastic which felt almost rigid when it was applied, and left we wondering whether it would come off cleanly. The Alpha 900 got a slightly more flexible feeling sheet with a similar not too glossy, slightly uneven surface. 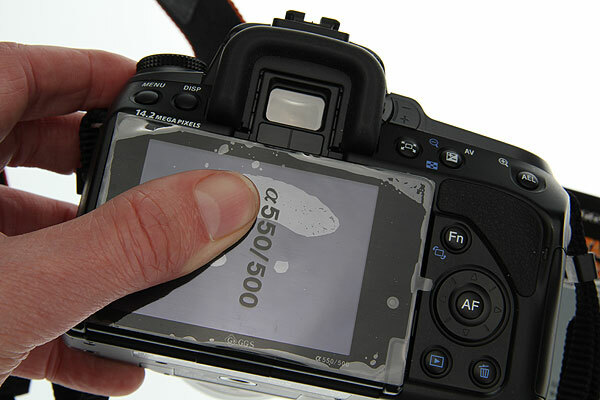 The Alpha 380 was given a Fujifilm LCD protector from the local shop (packs of three, with a cleaning cloth, suitable for all screens around 2.7 to 3 inches). It was still on it in perfect condition when sold. The same pack of foils provided instant cover for the Alpha 550 although its screen and surround really demanded a slightly larger protector. Then, in February, two things happened. I order some kit from Poland and the on-line store (Foto-Tip) also had GGS toughened optical glass screen protectors. I’ve seen these labelled as Giottos Schott glass protectors and various other makes, generally at around £20 each in the UK, and had my doubts about the idea of fitting adhesive glass to my camera. Also, Alpha fit types were not all that visible in the UK. But Foto-Tip had Alpha fit glass protectors for the A700, A900, A350 and even the A550 – all the Alphas we are currently using. They were well under £10 each including postage – cheaper than plastic clip-on protectors, a bit more than most peel off films (which also tend to come in packs of two to three, though this is rarely made clear when advertised). So I ordered the entire set. You can see them above. 2018 update: You can find new GGS Larmor screen protectors on Amazon UK or WEX Photo Visual as well on eBay. B&H have plenty of other brands and types but not this. Before trying anything, I examined the screens and checked their reputation on-line. It seems that they consist of much the same laminated glass and polymer film sandwich which forms the hardened glass for professional Canon LCDs, and that the adhesive is an elastic optically clear gel made by 3M and very similar to that now being used for the intermediate layers in LCD assembly. In other words, adding this would add a layer – but to the same standards as normal glass-faced LCD, without the superior coating found in a camera like the Canon EOS 7D. Which camera to treat first came about when the second thing happened – the plastic protector foil on the Alpha 550 must have come loose on a corner, stuck to my jacket and pulled off. I returned from shooting outdoors to find the screen no longer protected, and the camera had been swinging around with zips, straps, other cameras and all kinds of scratch hazards. It was still perfect, fortunately. Using a microfibre cloth, I cleaned the 550 screen very carefully and followed the simple instructions. I left the top plastic protector in place, but they recommend you remove this before fitting as it makes alignment easier. Every GGS protector has a neat black printed edge frame with the camera name. This helps with handling, as if you do get a tiny edge of finger touching the adhesive gel, any resulting mark is hidden behind the black surround. The Alpha 550 screen surface is slightly recessed. This helped greatly with the exact alignment of the very large cover glass, which goes beyond the image area of the screen and covers all the original plastic face of the panel. There is a shaped edge to match the indent in the rectangle, and a hole in the black frame for the activity light to show. Alignment was very easy indeed with the rigid screen – far more so than with flexible foils. The adhesion was instant, and perfect, without a single bubble. Unlike a foil, this optically plane sheet doesn’t trap air and even if you did get a dust speck in the sandwich, the gel glue surrounds it without an air pocket. The thickness of the glass leaves the screen now slightly raised, not slighly sunk, but the edge is beautifully ground and polished so that there is no question of a sharp encounter with your nose or hands. The old foil protector had never reallty been totally clear and was always visible; the GGS protector, though lacking a multilayer coating, improves visibility in daylight compared to a plastic protector. The perfect flatness of the glass and perfect fit to the camera make a very rewarding finished job. Does it void the warranty? Will it ever be removable? Will the 3M glue layer go yellow with age, or harden and lose contact? Will the screen crack if hit – or will the extra layer stiffen the overall assembly and reduce the risk of damage? It’s such a permanent-looking and feeling job that I may never find out. GGS say the screen may need to be gently heated, and eased off using a scalpel blade. 2018 update: the latest GGS, Afunta, Vello and similar glass protectors use a silicon adhesive which is even better for fixing, but allows removal with just a fingernail to lift a screen corner. The Alpha 700 had a patinated LCD – six months of unprotected use. Careful cleaning minimised this. 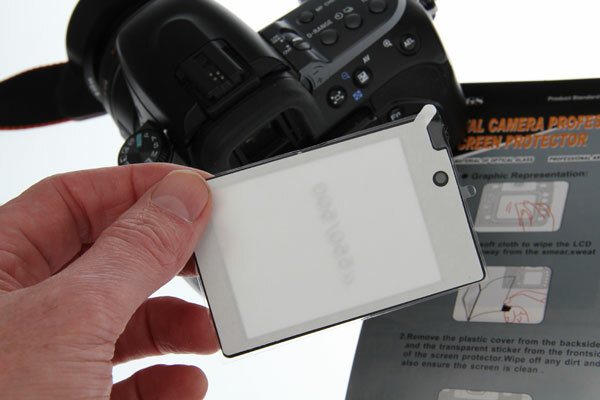 The GGS glass screen fits neatly, with its whole thickness adding to the screen which starts flush with the camera. The edge, again, does not feel likely to cut or injure but it becomes the ‘hardest’ edge on the camera. Surprisingly, the adhesive gel seems to remove any the visible blotchiness of the hard coating along with the fine scratches. The single most visible small mark on the screen remains just visible. 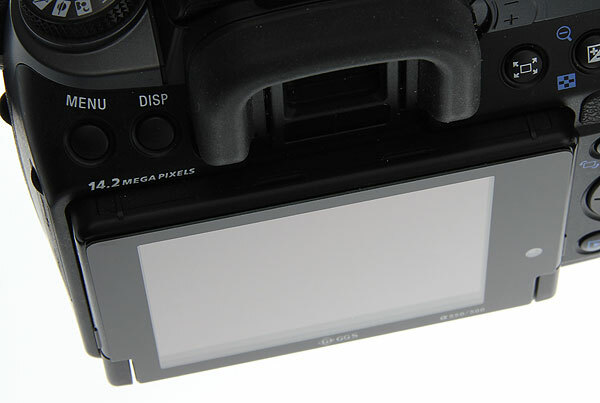 While the added glass layer can not improve reflections or viewing conditions, it beats the clip-on plastic shield through which everything was diffused before. The Sony name at the bottom of the screen is now hidden, but can be glimpsed refracted through the clear edge of the protector which sits proud of the surface. Much the same applies to the Alpha 900, but the screen is slightly recessed (more like the A550) to start with and is changed to having a slightly proud edge once the glass is fitted. It is a bit neater than the A700. It’s recessed just enough to hide the Sony name at the bottom of the screen fully, it can’t be spotted through the side of the glass thickness. Finally, the Alpha 350 has a thick plastic LCD protector as its outer layer and this stands well proud of the surround. My thought, which I still don’t dismiss entirely, is that this sheet looks as if it could be removed and replaced with the GGS glass. But I was not going to attack my Alpha 350 with a scalpel to find out. If you had a 350 with a cracked cover sheet, it could be worth trying. With the GGS glass added, the 350 has a pretty ‘high build’ screen – the glass increases the thickness of it by about 50%. It is already pushed into your face compared to the A550, or any other Alpha, with the viewfinder eyepiece too far forward. The extra 0.3mm or whatever it is (I have not measured it) is just a little more ergonomic negativeness. But the edge still feels safe not sharp, the screen assembly appears to be given added rigidity, and I’m happy that this is a good permanent protection for an exposed and vulnerable LCD cover surface. Update: two months after this post was written the NEX mirrorless range was launched, and I visited Croatia to be one of the first journalists to use the system – reported here. We transcribed the launch presentation too. But after less than a year, the rear LCD screens of NEX models were showing signs of serious deterioration. I decided to risk my camera after studying how the screen was made, and removed the top layer. The GGS (actually a JYY branded version) screen protector turned out to be able to replace the worn original plastic top layer easily and I wrote about this in April 2011, sparking off hundreds of YouTubers and bloggers to follow our lead. At the same time, I was fitting my Nikon D5000 with a Delkin Silicon Skin. I just fancied giving my ‘car camera’ a bit of extra protection, and maybe some damping for better video sound. The silicon skin comes with a couple of screen protector foils. Despite the LCD of this camera being kept face-to-camera (concealed) all the time, and rarely used except for video shooting, my careful cleaning and dusting did not prevent several dust spots and bubbles with the first protector foil. So I removed it, cleaned again, and fitted the second. Still one bubble – and it won’t go away! That is one very big benefit of these GGS glass protectors. They don’t get bubbles, they are easily fitted with perfect straight alignment, and after a day’s use and handling I have found a quick polish restores a perfect surface. Hopefully, they will resist scratching for years not months, and never need to be prised off their host bodies. 2018 update: you can read my post about the 5th generation GGS Larmor product here. Thanks for the tip off on these protectors David. I had been using the Sony soft protector with a third party clone of the Sony hard (but still easy to scratch) cover over the top of it. The original Sony hard cover broke one of its tabs quite quickly. The reason I sued the soft film protector as well was that I know that a piece of grit can get between the hard protector and the LCD and scratch it. Anyway, I ordered one of the GGS covers for my A900 and have fitted it, lovely! One comment, I noticed on close examination that the adhesive is only applied around the perimeter of the protector, hidden by the black mask. There is therefore a tiny air gap between the LCD and the main part of the protector. No need to worry about yellowing of adhesive with age. The GGS glass is fantastic. I put one on my A700 about 6 months ago. What a nice difference in quality and overall usability. Aesthetically, it’s much more ‘elegant’ looking on your camera body. And then practicality speaking, it’s clearer, a lower profile, and easier to clean, than the old plastic versions. Well worth the money. Bought one for my A550. Thanks very much for the tip. Thanks for another brilliant and informative article – love your writing style! These GGS protectors seem to be very popular in the online forums I’ve seen. I recently bought 3 (hopefully a lifetime supply), but am waiting for the plastic protector I bought with my A700 to get scratched or come loose before I fit one. I got mine from Dealextreme in Hong Kong. Their price is about £5, with free worldwide shipping (though I see the A700 protectors are on back order, which may mean they are permanently unavailable). Delivery can take a while, but I’ve found them very reliable. 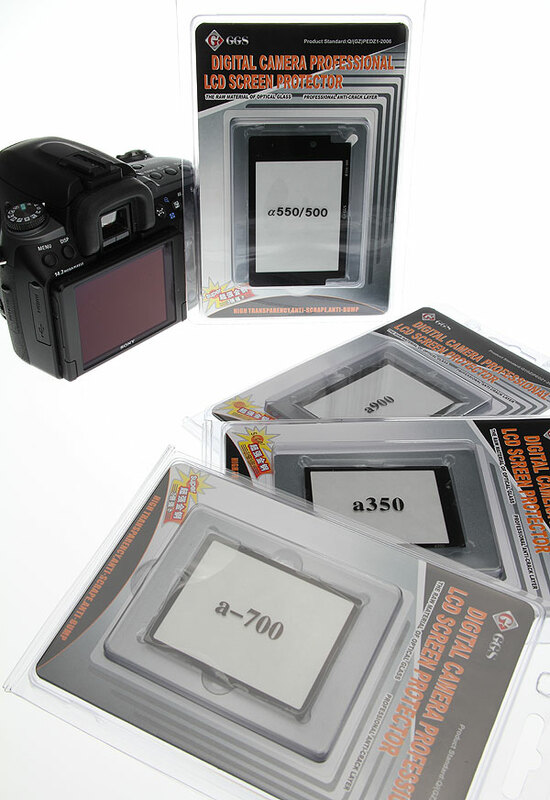 They had the A700 when I bought, clearly as you can see the pack in my product shot! I did not look for A100. Maybe they are just out of stock following a rush of orders? My stats show that this article has sent hundreds of readers to the Foto-Tip website, presumably to check out the screens and maybe to order. Given that Foto-Tip do them at half the price of the same protectors from rip-off UK vendors, it’s not surprising. They only seem to have these screens for A900, A230, A500 for sale. I would have liked to buy for A100 and A700 – do any of these fit please ? This post comes just at the right time for me, as my protection film already comes loose again. Thx for the useful hint.